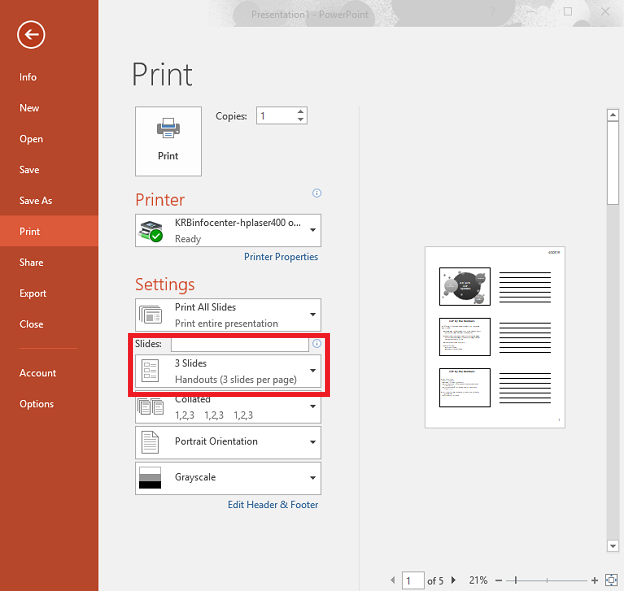 PowerPoint now has the option to print multiple slides per page. Select "File", then "Print". Below the "Settings" section, click the "Slides" drop-down menu. There is a "Handouts (3 slides per page)" option that will add space for notes to the right of each slide. If the version of PowerPoint installed on your computer does not support the option above, you can also use Word to create handouts with multiple slides and notes per page. Open the PowerPoint presentation that includes slide notes. Choose the File tab on the ribbon. Click Export in the list on the left. Click the Create Handouts button on the right. The Send to Microsoft Word dialog box appears. and Paste options, and red circle around the OK button. Under Add Slides to Microsoft Word Document, select Paste. Note: If you may be making edits to your slides, select Paste Link as well. This will automatically update the Word file if you make any changes to your slides in PowerPoint. Your slides are automatically imported to Word. Be patient: this may take a minute or two, especially if there are many slides. Posted - Tue, Feb 7, 2017 at 8:53 AM.